Jesus speaks to his disciples and many other people from the side of the mountain. FTER JESUS HAD chosen his twelve apostles, who were still called disciples, he took them apart from the multitude to teach them how to do his great work. Up the side of the mountain they went together, and there Jesus sat down. His disciples stood near and he spoke to them. Other people also climbed the mountain to listen to the great sermon Jesus preached that day. 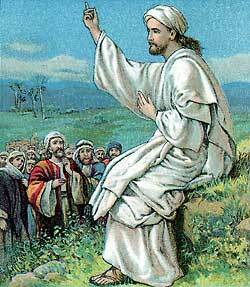 In the beginning of his sermon Jesus said: "Blessed are the poor in spirit: for theirs is the kingdom of heaven." Perhaps he had been thinking about the proud spirits of the scribes and Pharisees. He knew that proud spirits will never receive his words and learn how to enter the kingdom of God. But people who are humble and who do not believe themselves to be righteous without God's help he called poor in spirit, and he said they are blessed because to them shall be given the kingdom of God, for which all Jews were seeking. He also said: "Blessed are they that mourn: for they shall be comforted." These words sounded strange to the listeners, for they had never thought that blessings belonged to those who are grieving because of troubles and sorrows. They did not realize how God loves to comfort the weary and sad. "Blessed are the meek:" said Jesus next, "for they shall inherit the earth." By these words he meant that gentle people who do not lose their temper and allow thoughts of discontent to fill their minds will be happy and will enjoy the blessings God gives to all men. Then Jesus said, "Blessed are they which do hunger and thirst after righteousness: for they shall be filled." Perhaps he was thinking again of the proud Pharisees, who believed they were righteous in themselves and therefore did not need to repent of their sins and seek the righteousness of God. Only those are blessed with God's righteousness who long for it as earnestly as they wish for food and drink to satisfy their appetites. "Blessed are they who show mercy to others," said Jesus; "for mercy shall be shown to them. And blessed are they who have pure hearts; for they shall see God. And blessed are they who make peace among men, for they shall be called the children of God." These words the disciples understood; for they knew God will surely bless people who show mercy, and people who will not allow sin to enter their heart, and people who bring peace where trouble is. Then Jesus said: "Blessed are they who are persecuted for the sake of righteousness; for theirs is the kingdom of heaven." These words sounded strange; for people who are persecuted are greatly troubled, and the disciples may have wondered how the kingdom of God could belong to them when trouble was filling their lives. But afterwards they learned how people who are being persecuted for the sake of righteousness can be blessed as citizens of the kingdom of heaven. And after Jesus had been crucified and had risen from the dead, they themselves learned what it means to be persecuted for the sake of righteousness. Jesus said that those who are so persecuted should rejoice and be very glad, because there is a great reward awaiting them in heaven, He reminded them of the persecutions that came upon the faithful prophets, and perhaps they thought of Daniel in the lion's den, and of Jeremiah in the deep dungeon. In this wonderful sermon Jesus told the people how Christians should live. He taught them how Christians should pray, and how they should treat their enemies and their friends. He told them, too, about God's love and care for those who trust him. At the close of his long sermon Jesus said: "Those who hear my words and do them are like the man who builds his house on a foundation of rock. When the winds blow and the rain falls fast, that foundation of rock will stand firm, and the house will not fall. But those who hear my words and do not obey them are like the man who builds his house on a foundation of sand. When the winds blow and the rain falls fast, that sandy foundation will be washed out from beneath the building, and the house will fall." Jesus meant by these words that people who hear and obey his teaching will be saved. And when the storm of the judgment day comes they will be safe from harm. But people who hear his teachings and refuse to obey them will not be safe when the storm of the judgment-day comes upon them. When Jesus ended his sermon, the people looked at each other in surprise. They knew his teachings were more wonderful than the teachings of Moses and of the scribes and Pharisees. They wondered who could obey such commands as these: "Love your enemies." "Pray for them who treat you wrongly." "Do good to them who hate you." But they knew that Jesus' words sounded as though they were the words of God, and by and by many of them learned that even the hardest commands could be obeyed by those who truly love the Lord.